The red snapper is one of the most popular saltwater fish of North America. 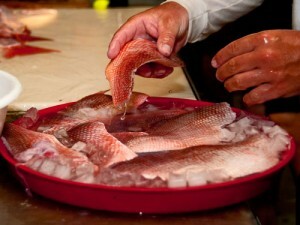 Red snapper range from North Carolina to the Florida Keys and throughout the Gulf of Mexico to the Yucatan Peninsula. Red snapper are bright pinkish-red on the back and head, fading to a silvery whitish below. They may attain lengths of 36 inches or more and weigh up to 50 pounds. Their meat is firm and white, with a mild sweet flavor.